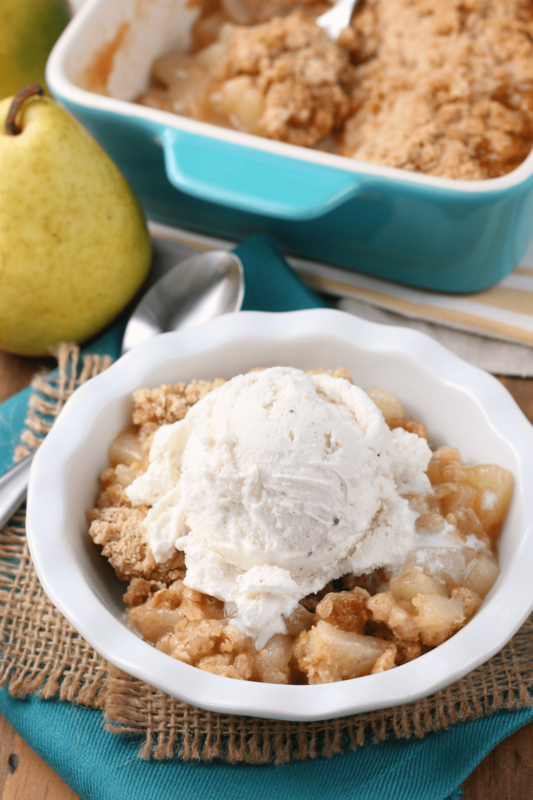 This Honey Pear Crisp is lightly sweetened with honey and topped with a light, buttery streusel to allow the delicate flavor of the pears to shine through! This simple recipe is easy to throw together for a last minute, seasonal dessert! *Post and recipe from 08/30/13. Images updated 09/22/17. For some reason I have never really baked with pears. I love enjoying them fresh, and I like eating pear desserts that other people have made. However, I have yet to experiment with them much in baking of my own. I know now that I shouldn’t have waited so long! This honey pear crisp is so good. Easy and simple, while letting the delicate flavor of pear shine through! I recently found myself with a bunch of pears that needed to be used before we left for a weekend. Since apple crisp is a favorite around here, it only seemed natural that one of the first pear recipe I tried would be a crisp. I switched up the base of my apple crisp and got to work. The main difference was the amount of streusel used. 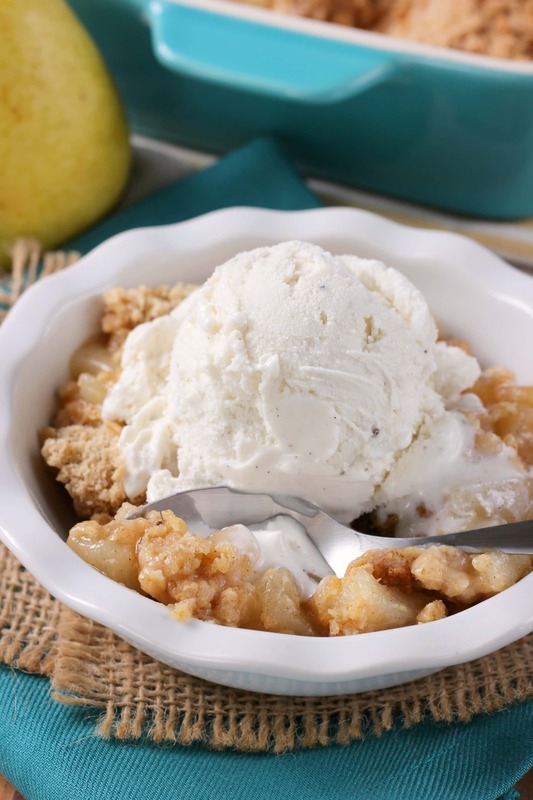 While I normally prefer a thick layer of topping on my apple crisp, this light layer is just right for the delicate flavor of pears. The other main difference was the sweetener. For this pear crisp I went with honey. Honey combines with the pears as the main sweetener to keep the true flavor of the fresh pears without making it too sweet. A bit of cinnamon is stirred into both the filling and the streusel topping to round out the flavors. 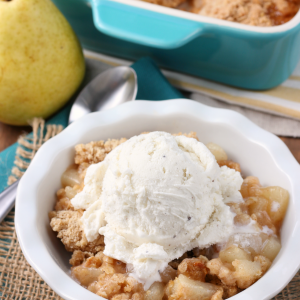 Since crisps are quick to make, it is easy to throw this seasonal honey pear crisp together for a quick dessert for unexpected company or just to enjoy after a long day! Preheat oven to 350. Lightly spray an 8x8 inch or equivalent sized baking dish with non-stick cooking spray. Combine pears, lemon juice, and honey together in a bowl. Gently toss to coat. Sprinkle cornstarch and cinnamon over pears. Gently stir to coat. Whisk together flour, oats, brown sugar, cinnamon, and salt. Cut in butter until mixture resembles coarse crumbs. Pour filling into baking dish. Sprinkle on topping. Bake for 25-30 minutes or until filling is bubbly and topping is golden brown. Allow to cool for 15 minutes before serving warm. I never bake with pairs either, but I really want to this fall!! This crumble looks perfect! This looks great. I pair pears and blueberries in my baking. Always a good combination. Pears totally don’t get all the attention they deserve in the fall/winter months! I am SO starting off on the right foot by making this crisp. The fruit looks so cozy in there, buried under the crumbly topping! Great recipe. I love pears! I also like that you used honey instead of sugar. Looks delicious! I haven’t cooked with pears either. This looks delicious. It would be very warming on a cool fall night. I never bake with pears, but I love them! This looks scrumptious! I haven’t done much with pears either and have NO idea why!! Love the idea of throwing them in a crisp! I love desserts with a crumbly topping. This looks fabulous! This looks wonderful! I love baking with pears and now you’re making me want to! Yum! That is lovely. I think this is the perfect dessert to showcase pears! Pears need more lovin that’s for sure! How cute is your honey dipper?! 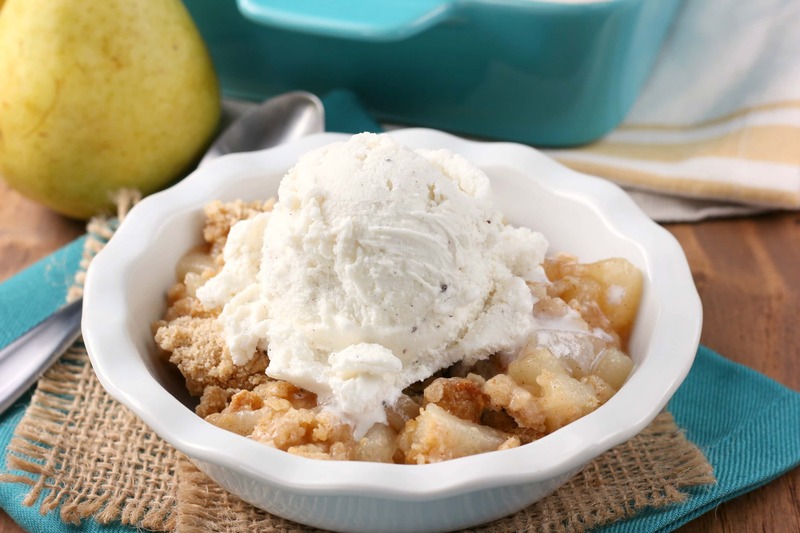 I love making apple crisps… must try the honey pear variation! Looks phenomenal! Can you believe I have never baked with pears before?! I don’t know why I’m waiting for an invitation or anything, because it looks so easy and delicious! I love pears so much, and they totally epitomize fall for me. I want to face plant this crisp! 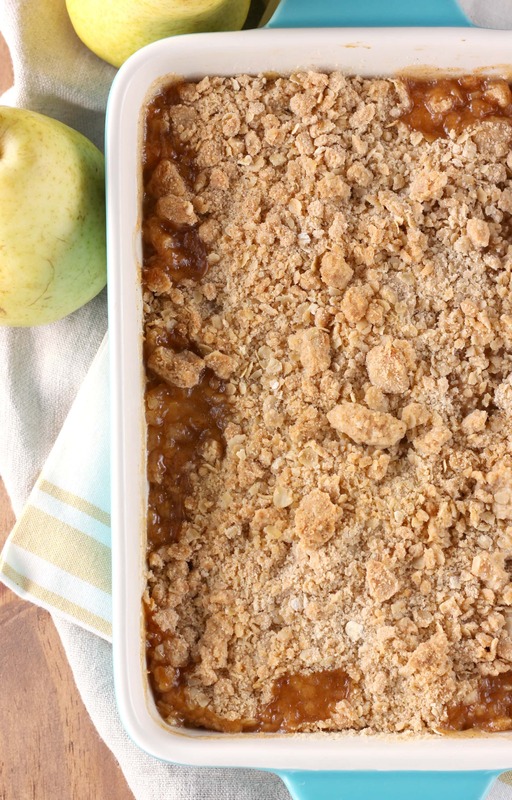 Fall always makes me excited for pears and apples and this crisp looks like the perfect way to celebrate them! I love crisps! This looks awesome! I looooove honey and pears, so I know this will be much loved over here!